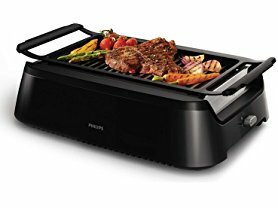 Hurry over to Woot.com because today only this Philips Smokeless Indoor BBQ Grill is just $199.99 (Reg. $299.99)! No need to adjust the heat! The grill quickly heats up to a consistent 446°F, the optimal temperature for searing meat, leaving it juicy and tender on the inside. Shipping is FREE for Amazon Prime Members or only $5 flat rate all day.